Borobudur is located in Magelang city which is known as one of the seven wonders of the world. No wonder this place became a popular tourist destination in Indonesia. Travelers from all over the world have visited here. Not only from various cities in Indonesia, but also from abroad. Located about 30 Km from Borobudur Temple, you can visit Ketep Pass. This spot is placed on Sawangan Hill with the altitude of 1200 meters above sea level (asl). 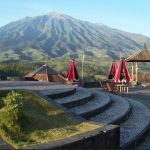 From this hilltop, tourists will be able to see the scenery of Mount Merapi and Merbabu. Ketep Pass also has varied facilities. You can visit the Museum of Volcanology or watch educational films in mini cinema which is available at the top of the hill. There are also two binoculars used to watch the view of Mount Merbabu or Merapi closely. And, there are some gazebos for tourist relaxation areas. 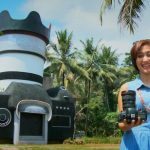 About ten minutes to the north of Borobudur Temple, there is tourist attraction called Camera House. If in some various big cities there are Upside Down Worlds, then Magelang has Camera House. This place provides instagrammable photo locations. Outside the room, you can try posing with the background of Camera House building in the shape of a DSLR camera. Inside, you will find some paintings for background of photos. Seeing this place you might be thinking if the homeowner is a photographer or a hobbyist of photography, but your guess is wrong because the owner of this house is a painter. The owner of this house is MrTanggol, he comes from Semarang who once lived in Bali in a long time. Mr. Tanggol is a man who has spent his years in the field of painting and he has received various awards. Bukit Rhema as known as Chicken Church is also a must visit place that you are going to lose many experiences if you miss this place, when traveling to Borobudur, especially, because it becomes one of the filming locations of Ada Apa Dengan Cinta (AADC) 2. Moreover, the uniqueness of this building design also makes it a perfect location for hunting instagrammable photos. Bukit Rhema is also an alternative to watch the beautiful sunrise on Borobudur. 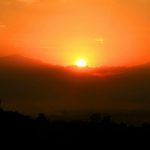 You can feel the atmosphere of private sunrise on this hill, in contrast to Puthuk Setumbu that mostly crowded of visitors. In addition, Bukit Rhema entrance ticket is not as expensive as when watching the sunrise via Manohara Hotel; Rp 275.000 per person. Here, you just pay an entrance ticket of IDR. 15,000 per person for local tourist and IDR. 30,000 for foreign tourist. Visiting Candirejo Tourism Village is also an interesting tourist activity that can be done during travelling to Borobudur. This tourism village is located only about 5.5 Km from Borobudur Temple and can be reached in no more than 15 minutes. There are many local and foreign tourists who stop by at this Village Tourism of Candirejo hamlet, because the existence of this tourist village cannot be separated from the history of that grandest temple establishment in Southeast Asia. In this tourism village, tourists can perform various activities. You can try to walk around the village on foot or by horse riding. In addition, you may try to see the local resident’s art performance. Tourists also have opportunity to interact more closely with the surrounding community by staying at resident’s house. Furthermore, you will see the thrill of the Nyadran Traditional Ceremony performance which always be done every month of ‘Ruwah’ based on Javanese calendar. Finally, you can try to feel the warmth in the Hot Water Bath of Umbul Temple (Candi Umbul). This place is located in Kartoharjo Village, Grabag, Magelang District, not too far from Borobudur; about 38 km. Like the Borobudur temple, Umbul Temple (Candi Umbul) is also a relic of the Syailendra House who once controlled the area of Central Java. In this temple area, you will find the existence of two pools. The first pool is placed at the top and it is a hot water pool. Meanwhile, the second pool is a regular pool with cold water. Some said that these two pools were used to be bathing places for noble princesses. It is guaranteed, you will miss to come to the places above again someday. You just simply set aside a few hours to go there and the locations of those places are surely not far from Borobudur. Interested?